I'm trying to find a way to add new sessions to existing test case (not a new). It seams that this is not possible if i load session saved earlier in .saz file. When i load such files, in context menu i can only "remove" these sessions from test case, even they are not in it. To add them i have to reissue session and then i have possibility to add it to test. But my question is how to do this without this. You can add new sessions to a test case. You cannot simply add the existing in the test case sessions, second time, but there is a workaround. To use the rule 1: First, add the new sessions to the fiddler grid using one of the following methods: (a) capture browser requests, (b) open an existing .saz file, or (c) reissue existing session in fiddler. 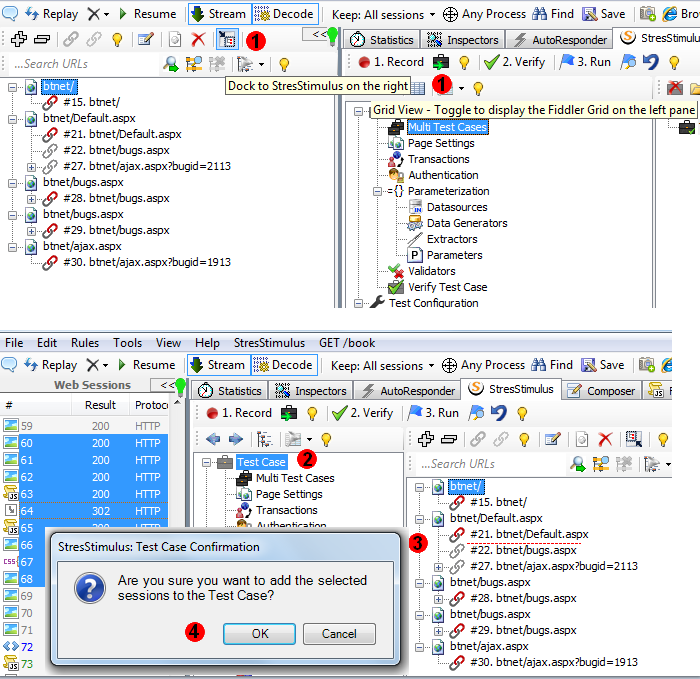 After that, drag-and-drop the new sessions into desired position in the test case tree. To use workaround for the rule 2: After you open a test case, the fiddler grid will display "existing" sessions that cannot be added again. However, if you clear the fiddler grid and from the fiddler menu open the saz file from the same test case, the sessions in the fiddler grid will be consider as "new". Therefore they can be added to the session again by dragging-and-dropping them into desired position in the test case tree. So by using this technique, you can add existing sessions without reissuing them. In the next version we will provide an easier way to clone existing sessions. could you describe (maybe with some screenshot) how it is possible to dragg-and-dropp any session to test case? As a result, the Fiddler Grid will be displayed on the left. 3. Select new sessions in the fiddler grid, drag-and-drop them to desire position. The red-line pointer will show you where the requests will be inserted.